pathways whose hyperactivity leads to an exaggeration of motor function such as spasticity, rigidity or muscle spasm. 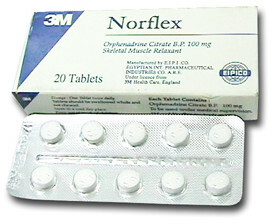 Norflex Is indicated for the short term symptomatic relief of painful conditions of the musculo-skeletal system such as low back pain and lumbago. Tablets Adults : 2 tablets daily, 1 in the morning and 1 in the evening. Injection Adults : The contents of one 2 rnl ( 60 mg ) ampoule intramuscularty or intravenously The intravenous injection should be administered over a period of about five minutes, preferably with the patient lying down After the initial injection, treatment may be continued with Norflex tablets ( 100 mg ), one tablet twice daily, Alternatively, Norgesic tablets ( orphenadrine carate 35 mg combined with paracetamol 450 mg ) may be given in a dosage of two tablets three times a day. 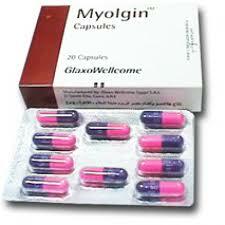 elderly, a daily dose of not more than 100 mg is recommended in patients over the age of 65. Children : Not recommended for children under 12 years. disappear following reduction of dosage or cessation of treatment. Some patients may experience a transient feeling of lightheadedness or dizziness following an injection of Norflex. Norflex should be used with caution in patients with tachycardia. obstruction of the bladder neck) and myasethaenia gravis It should not be given to lactating mothers. Symptoms of orphenadrine citrate overdosa:ge Excitement, confusion and delirium leading to coma. convulsions, tachcardia Dilated pupils and urinary retention may occur. Treatment : Convulsions and delirium respond to relatively large doses of diaze am, preferably by mouth Adequate hydration of the patient is imf?Ortant. There is no evidence as to drug safety in human pregnancy nor is there evidence from animal work that it is free from hazard Avoid in pregnancy unless there is no safer treatment. TENTH OF RAMADAN CITY A. R. E.